Are you looking to purchase a new area rug? It may be time to change the interior design of your home or office. Area rugs are a great option in design and are very affordable. Whether you want the area rug for floor protection against heavy traffic or a design overhaul this could be a great option for you. Here are a few tips on options, styles and benefits of area rugs. Area rugs are extremely popular in interior design. The styles and looks vary from the traditional to the more contemporary flare. Casual styles have very basic, clean patterns and colors. This style can be paired with surrounding complementary elements and made to have any style. Some casual designs are noted for their asymmetry and their warm aspect that diversity a room’s pattern. Traditional styled area rugs are slightly different in appeal and style. These rugs are noted for their striking, bold use of color and or floral arrangement. There is a notably heavy border design and these rugs may even have Persian nuances. Transitional rug style sit right between the two mentioned. They are a combination of bold and traditional. They have traditional color schemes but also have a contemporary aspect to them. Even when it comes to outdoor design can area rug and be just the right touch you need. Outdoor rugs should be purchased for their durability in inclement weather and heavy traffic. The style is also important. Area rugs can compliment any space. But the sizing must be accurate to maximize the impact the rug’s design can have on the space. If you decide on an area rug with a border, you should make sure the size is a foot smaller that the dimensions of your room on every side. Decide where you rug will go. Are you placing it under your dining room table? Make sure the rug us 3 to 4 feet larger that the dining table itself. 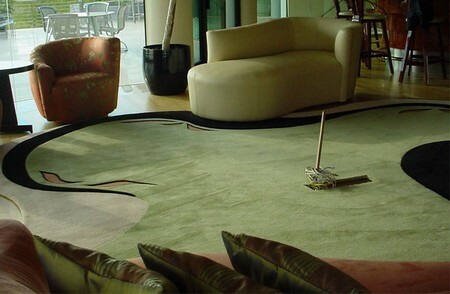 The material of your rugs should depend on where they are placed as well. Both cotton and wool rugs are the most durable. They are also very easy to keep clean and maintain. The softer rugs like those made of jute tend to be better choices for intimate spaces like bedrooms. You want to choose a material that can withstand some wear and tear in the high traffic areas of your home. Whatever you style needs are they can be improved with a simple addition of an area rug. You can shop online outlets to price compare and save money on your new investments. There may even be sale options and interest free specials that will help you keep costs low.